Courtesy of WOWSA, Tsugaru Channel, Japan. Andrew Hunt, a 16-time Australian veteran of the Rottnest Channel Swim in Western Australia, has set off on his Tsugaru Channel crossing attempt around midnight with his sons Bede and Jasper Hunt on his boat escorted by Captain Mizushima. 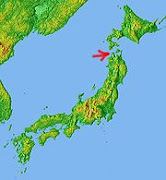 The 56-year-old's progress across the 19.5 km channel in northern Japan can be tracked here. Other solo and relay crossings in various Japanese channels are posted on the Channel Swim Japan Facebook page. 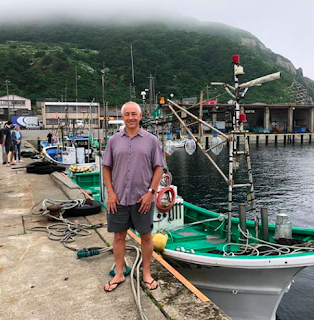 Fellow Australian Lynton Mortensen will also attempt his Tsugaru Channel crossing between August 14th - 17th. "That will be my 6th channel of the Oceans Seven if the planets align and Poseidon plays nice. Cook Strait will be the 7th and last," says the 54-year-old Mortensen who will similarly travel with his 3 children and wife. "[Doing these channels] is a wonderful journey with family and friends and supporters - it is such a privilege to be out there in the blue yonder in my favorite team sport. Being the water with the world swimming tribe is a magical place to be."